My nine-year-old son talks in his sleep. (Sometimes he even walks in his sleep, which scares the heck out of me.) He always says the sleepiest, sweetest, most nonsensical things. The other night, he called me, I went into his room, he said, “mommy, how do you cook dinner so fast?” and then he lay back down, asleep. He had no memory of it the next day. By the harsh light of day, the truth is that I don’t always cook dinner so fast. Sometimes I make dinners that take all day, on and off. But, as it happens, some of the best dinners are dinners that take no time at all. This doesn’t mean they’re dull, it just means that we’re vegetarians, and the best vegetables are frequently lightly cooked vegetables. So, here’s a good meal for a night that you want something quick and tasty. Kale and carrots braised in white wine with thyme and caraway seeds, served with israeli couscous made into a sort of pilaf with apricots and pistachios and goat cheese. Simple. Here’s the Budos Band’s version of Sing a Simple Song, to listen to while you make this simple dinner. Boil a pot of salted water, drop the kale in and cook 5-10 minutes till it’s soft but bright green. Drain. In a large frying pan over medium heat, melt the butter. (You could add shallot of garlic at this stage, if you wanted, but I wanted to keep it simple) Add the thyme and caraway seeds. When it’s bubbly, add the carrots. Stir and cook for a few minutes, till they start to brown and soften. Add the kale. Stir and cook for a few minutes more. Add the wine. Bring it to a boil, and then reduce the heat and simmer till the liquid is mostly gone. Don’t cook it too long, because you want the vegetables to be bright and a little bit crunchy. Season with salt and pepper and a squeeze of lemon. 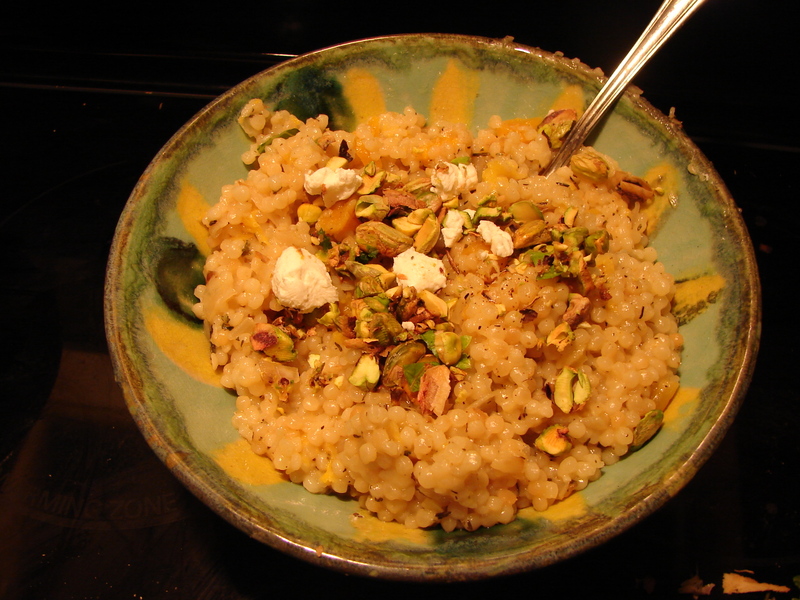 Israeli couscous with pistachios, apricots and goat cheese. In a medium sized sauce pan over medium heat, warm the olive oil. Add the shallot, cook for a minute or two, add the garlic and herbs. Cook for a minute. Add the couscous. Stir till it’s all coated and cook for a minute or two till it smells a little toasty. Then add the apricots. Stir and cook another minute. Add 1 3/4 cups water. Bring to a boil, and then reduce the heat and simmer ten to 15 minutes till all the water is absorbed. Season with salt and pepper. Serve with pistachios and goat cheese crumbled on top. 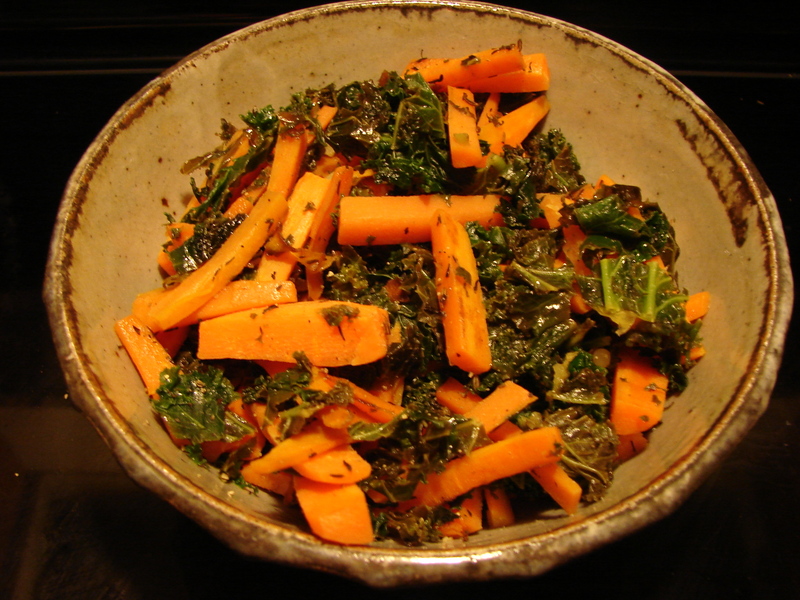 This entry was posted in recipe, vegetable side dish and tagged apricots, braised vegetables, caraway seeds, carrots, goat cheese, israeli couscous, kale, pistachios, thyme by Claire. Bookmark the permalink. How is “Israeli couscous” different from real couscous? Well, it’s made up of larger balls of pasta. Apparently (according to this article) there’s a Lebanese version as well. I thought Isaac would like it, but he took one look and ran crying from the room! The recipe would work equally well with regular couscous, although you’d probably want to cover it and turn the heat off, right?